"I can't believe everybody clapped!!!" "That's all that matters ... these caring, sharing girls." 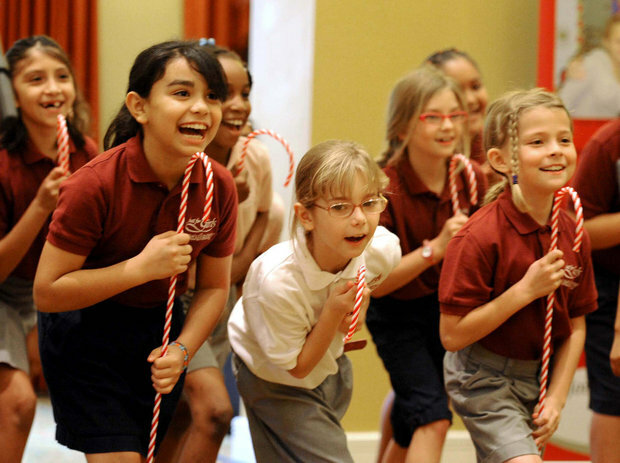 That first was a gleeful shoutout by one of the 30 young third-graders who had just finished a trio of holiday songs to lift our spirits -- as if we needed anything more uplifting after the positive report given on the new charter school, Just for Girls Academy. The academy was the focus of this year's annual luncheon with Just for Girls' donors and volunteers in Manatee County,as seen here in Herald photographer Grant Jefferies' gallery. The girls had just finished singing the last song -- "A Song of Peace" -- with magical untarnished belief, and there wasn't a dry eye in the house. Not only did everyone clap, but they were on their feet to praise the girls. And a teary-eyed chief executive Becky Canesse couldn't have been prouder in rounding up with what we all were thinking: These girls are what matters. That's why we were there. Grant and reporter/columnist Vin Mannix were there to capture the moments. Here's a shot of veteran Mannix in his new mode: videographer! And in this one below, I missed the best shot fumbling with my own iPhone. They were team-tagging, Grant with the stills that make up this beautiful gallery, and Vin filming the video below. Grant almost had his head on Vin's chin. You can still see his lense peering over Vin's shoulder if you squint. A newsroom junkie’s mantra: You should never go anywhere without coming back with a story to report. A beautiful one fell in my lap today. It won’t get huge headlines, but it’s one that must be shared. It reminded me that every gesture counts, that goodness does pay, that telling this story might prompt someone else to do a good deed. I found my lucky tip at Lucky Dogs, a great hot dog/sandwich café on Third Avenue west in downtown Bradenton. I had called ahead for a “Joan dog” to go -- a Lucky Dog sans onions, plus plenty of pickles. Co-owner Sheri Clinard answered with a “Gotcha!” that almost made me turn around. “No, no, I promise I’d never surprise you with bad news without warning,” she assured me. “You have to come hear this story.” So I did. Sheri prides herself on knowing everyone who comes into her shop more than once. But today, she didn’t recognize the man carrying a vase of flowers. She didn’t think much of it, welcoming a busy lunch crowd. But when the man turned to pay, he gave Sheri the flowers – and this amazing letter. Last year on Veterans Day, I came to the Lucky Dog for lunch. I had on a Dale Earnhardt Sr. jacket and a Vietnam Veteran hat. After I finished my lunch, I tried to pay for it but the lady (I don’t know her name) said Thank You for my service in Vietnam and lunch was on her! I was surprised and grateful because no one has ever said Thank You or bought me lunch for my service. Her thoughtfulness and words are in my heart almost daily. I gave her a hug and said Thanks, while trying to hold back tears as I walked out of the restaurant. She changed my life without even knowing it! I brought you these flowers today to try to show you my thanks. Each petal on the flowers represent each time I think of your kindness on that day. Thank you!! The Vietnam vet left Lucky Dogs today before Sheri could get his name. But one year later, Sheri’s act of kindness has come full circle. And we are reminded, on this Veterans Day weekend, that millions of men and women have served in the military to protect our freedom, as Jim Jones – himself a veteran – reported today in this wrapup of events. Throw politics aside for at least a day, and thank a veteran. You may change a life. Sheri did. My lucky day at Lucky Dogs! Good morning, Bradenton! As the sun shines here, the East Coast is bracing for "Frankenstorm" -- the pre-Halloween hybrid weather monster that is looking more ominous by the hour. And the "Eye Opener" on CBS This Morning? Your Bradenton Herald's front page! The national network news flashed today's cover, designed by 1A Editor Kelly Lipp, in the swirl of Sandy for the nation to see. Serious stuff, as they predict $1 billion in damages. But what a thrill to grab that attention! You early birds have been sending us "Wows" all morning. Being in front of a camera has never ranked among my favorite moments. 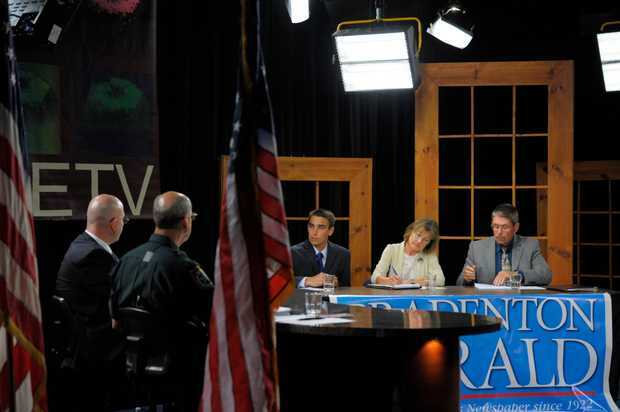 So you can imagine my angst when Herald Editorial Editor Chris Wille began scheduling televised candidate forums for contested races in Manatee County. And there are plenty! But now, three weeks into the debates, I realize how valuable this commitment by the Herald, Manatee Educational TV and Bay News 9 is proving. 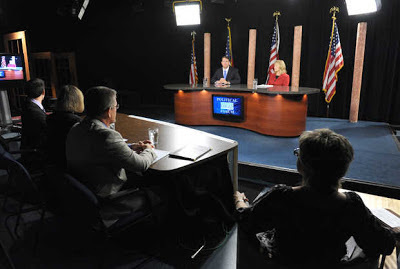 For each race, we brought the candidates together at METV for no more than an hour. They each presented their opening statements, then took questions from our panel: Wille, myself and a BN9 reporter. The videos are shown on Bradenton.com and METV continually. We also had a staff reporter and photographer cover each forum for campaign stories and galleries. Without exception, the candidates opened up to allow voters a chance to hear what's at stake. In at least two races, it was the first time the candidates had faced off together. And we heard from candidates and viewers alike: This public access is a true civic service, and worth all the hours (and jitters!). For those races that didn't find a televised slot, we brought the candidates to the Herald. One of the most interesting proved to be the Holmes Beach races for commission and mayor. We made sure to keep the forums open to the public -- and at least 30 residents attended the Holmes Beach sessions in the middle of the day. They submitted questions, listened intently, and then stayed around afterward for more discussion. The Herald literally became the debate hub. And the discussions led to today's editorial, in which the Editorial Board recommended a complete overhaul in both races. 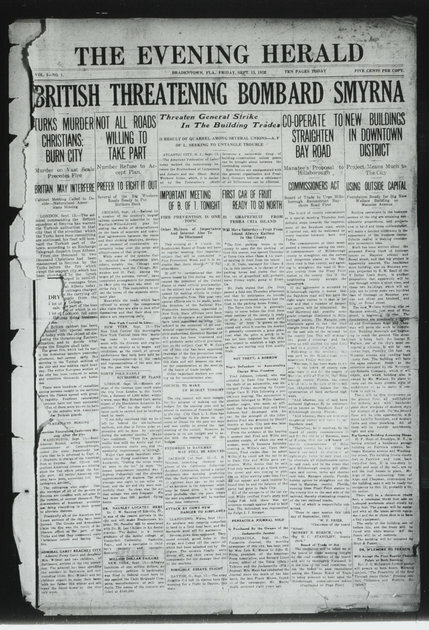 The first edition of the Bradenton Herald was published 90 years ago, and we haven't stopped since. Engagements, weddings and anniversaries. Babies' first birthdays. Sports spotlights, biggest fish caught, championship seasons. Social galas, neighborhood barbecues, vintage recipes. 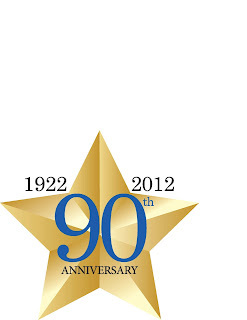 Graduations, homecomings and fund-raisers. Your four-legged family members. 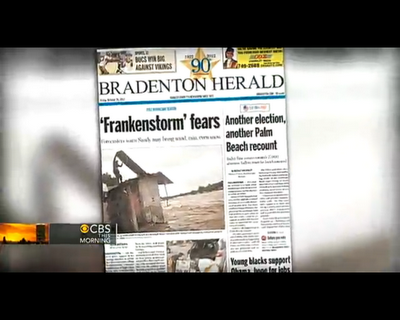 Send us photos of your Bradenton Herald clippings! Or call and we'll set up a time for you to bring them in to the Herald for a photograph. Or call 941-745-7000 and leave a message. Manatee football fans, check this out! Get your game face on by checking out our new weekly video feature, "This Week in Preps." Bradenton Herald sports writers are on Bradenton.com and METV (Manatee Educational Television) with the week's hottest previews for Manatee/Sarasota high school football. Here's a link to this week's show, running down all the matchups for Friday Night Lights. 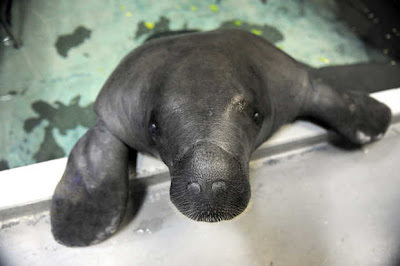 The Manatee Hurricanes, ranked No. 1 in the nation by MaxPreps and USA Today, go for their second victory of the season at Riverview. And they throw in a little banter on preps cross-country and golf this week. Herald sports writer Jason Dill hosts the show and welcomes fellow Herald reporter John Lembo and other sports staff members to discuss upcoming football games and highlights from other fall sports. The video series will be posted at Bradenton.com/sports each Thursday to preview weekend events and profile some of the area's top athletes. Two of our blogs have been getting a lot of attention from readers in the past week -- and they're both "extras" with postings coming from a lot of Herald newsroom staffers. The 2012 GOP Convention has been supplying plenty of blog-perfect content, so we spun off this Republic National Convention blog from our regular political blogging. And then Isaac reared his ugly head, sparing us for the most part, but now is barreling toward Louisiana and Mississippi. We dusted off our "Hurricane Watch" blog and thousands of you visited it in the past week. We're a partner with the Biloxi Sun-Herald, and have offered them help with production or online work. But we're hoping for the best: a non-event from Isaac. Stay tuned to the most current predictions on our blog. It's back to school week in Manatee County -- and that means photo opps galore! Herald Metro Editor Marc Masferrer decided to tap into that, asking readers to send him photographs capturing their children's first days back. Everyone likes it so much that we'll make it back-to-school week. All you need to do is email your photograph to mmasferrer@bradenton.com, and he will add your child's photo to our gallery. And it's by far the most popular posting on Bradenton.com this week. Check it out -- it's guaranteed to put a smile on your face. Jayleen, 8, Jestany, 7 and Jasity, 7, students at Virgil Mills Elementary. Each weekday, right after lunch, you'll receive a scrumptious recipe to try, courtesy of the Bradenton Herald. There's usually a theme each week -- and this week, it's Back to School (though I have to admit, that used to mean PB&J, not Chicken Avocado Pitas!). Sign up by Friday, Aug. 17, and you'll have a chance at winning a $500 room makeover gift certificate from Kirkland's, the new store at The Shoppes at University Park. Click here for all the information and directions. And get your kitchen or your grill and your taste buds ready for some mouthwatering experiments. Crazy. People are making accounts to follow me. I'm the only person many of them follow. Marjie, Although there isn't streaming of the trial, which I too would like, you can follow it live on Twitter from a BH reporter ( @EJohnsonBHcrime ) who is in the courtroom. If you don't have a Twitter account, you may consider setting one up. I just found this. She is tweeting often about what is taking place, being said, and who is on the stand. Hopefully this helps. 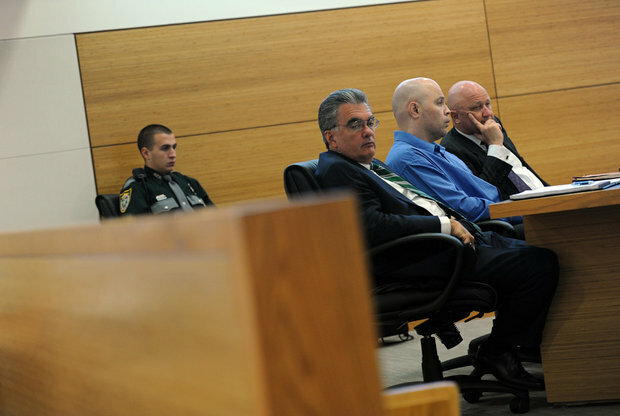 Delmer Smith, charged with the murder of Terra Ceia's Kathleen Briles, sits at the defense table between attorneys Daniel Hernandez and Bjorn Brunvand on the first day of his trial in Manatee County's Judicial Center. A recent front-page article in The New York Times stirred up a hornet's nest among journalists. The story by Jeremy W. Peters takes a look at the surprisingly common practice of "quote approval." I'll admit -- it took me totally by surprise. Apparently it has become quite common for journalists to send quotes back to campaign members and government officials after interviews for approval. According to Peters, "It was difficult to find a news outlet that had not agreed to quote approval, albeit reluctantly. Organizations like Bloomberg, The Washington Post, Vanity Fair, Reuters and The New York Times have all consented to interviews under such terms." Don't do it. We share this policy here with pride. Sure, as Jim notes, this can put our reporters at a disadvantage. But our mission statement declares that "we will passionately uphold the First Amendment." It's extremely rare that the Bradenton Herald will use unnamed sources, and then only with the approval of the executive editor and assigning editor. We may go off-the-record for background material, or if someone's information might endanger them. But in demanding that government be open for its citizens, we also must be transparent and "in the Sunshine" for our readers. Here is another link to the policy posted on McClatchy's site. The Herald is adding this to our policies section online, too. This is the Sunshine State. And that's how we do journalism. These two blog posts are so refreshing and fun -- they more than trump anything I could come up with today. So a huge "like" from the Editor's Blog to posts by Tiffany Tompkins-Condie on Through the Lens, and Wade Tatangelo on Buzz Worthy. 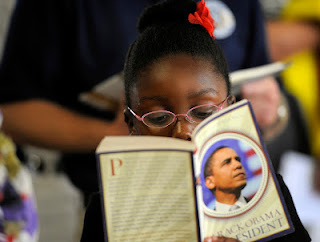 Tiffany writes with unabashed hope for the next generation in an unlikely match: children and politics. In the midst of bankruptcy hearings and litigation involving HRK Holdings LLC, the firm that purchased Piney Point before last year's disastrous toxic spill, Herald reporter Josh Salman has uncovered documents that point to potential negligence by the company long before the leak last summer gushed 170 million gallons of toxic water into Bishop Harbor. Salman's first investigative report published July 6 revealed that HRK notified environmental officials of a storage liner tear at Piney Point three months before the 2011 spill. And in today's published story, Salman reports that the Florida Department of Environmental Protection waived a stipulation for HRK to install a commonly used protective dirt coer -- after HRK agreed to assume full financial responsibility if something went awry. That dirt, experts say, might have prevented the liner cracks that caused the spill. An 11-page administrative agreement signed between HRK and the DEP waived that requirement in August 2006, according to emails and documents obtained by the Herald. A study later commissioned by HRK found that heat-induced stress cracks had penetrated the gypsum stack liner months before it ever was filled with water, contributing to the cause of the liner tears. That mistake certainly ruined my morning coffee. But the online version is intact, and we'll republish the missing lines Thursday. Stay tuned for more of Salman's reports on HRK and Piney Point. 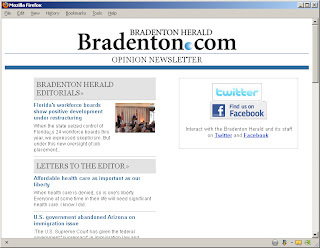 We're making it easier for you to tap into Bradenton Herald's community discourse through its editorials, letters to the editors, and opinion columnists. Bradenton.com has launched a daily Opinions newsletter, which will deliver the headlines and website links found on www.bradenton.com/opinion directly into your email about 9 a.m. every day. Just click here and follow the instructions to sign up. It takes about 30 seconds (and you'll see the other newsletters we offer as well). I've included the step-by-step below, just in case. What a great way to sharpen your debate topics for the day! The Bradenton Herald's editorials are meant to spark community discussions. They explore current events, almost always with a heavy emphasis on the local impact. They aren't news coverage -- the editorials stem from news coverage, often with additional research to form a reasoned opinion. That voice speaks independently of the newsroom, setting out the institutional beliefs of the Herald as a leader in the community. Editorial Page Editor Chris Wille authors most of our local editorials, usually after a lot of his own research and a healthy debate with the Herald Editorial Board. Members include Publisher Bob Turner, community representative Rosalie Shaffer, and the executive editor (that's me!). This mix helps us maintain credibility and balance -- the most valuable attributes that can be offered on an editorial page. We want to broaden our reach, and we hope this newsletter helps accomplish that. Open up the latest Leonard Pitts column on your iPad, and comment away! Or send us a letter to the editor via your iPhone. Just sign up for the newsletter by July 9, and you'll be entered to win a lunch with Chris Wille. That's right, there is such a thing as a free lunch -- well, almost. 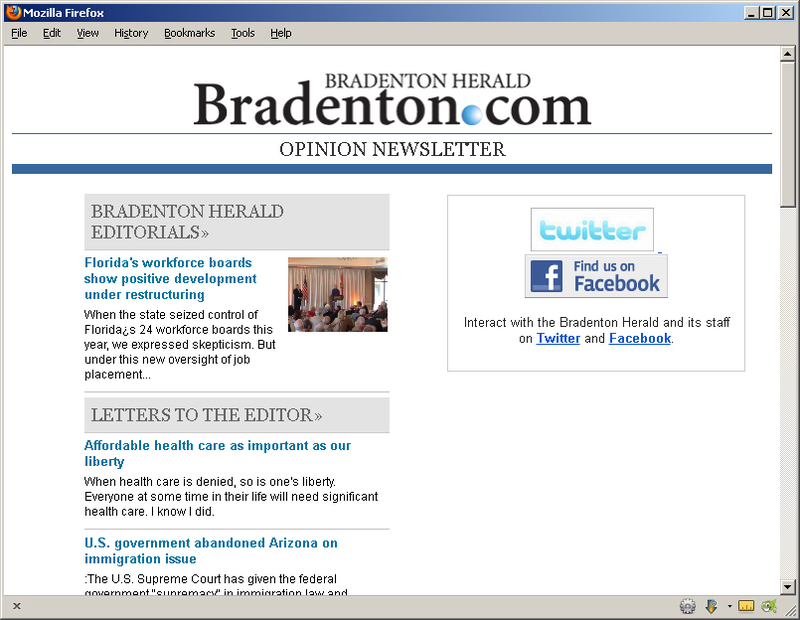 First, sign up as a member of bradenton.com. If you don't have an account, click the "Join" link in the upper right section of any Herald web page. After you have successfully logged in, click on your user name. This will take you to the Member Center. Once there, click on the blue "Newsletters" icon in the right column. This will take you to a list of your newsletter subscriptions. Add a check mark to the box by "Opinion Newsletter" and click the "Save Edits" button at the bottom of the page. That's it. You'll start receiving the Opinion Newsletter the next day it's sent. UPDATE, Friday, 6-29: This is a link to all of the candidate forum videos. The Bradenton Herald launched its election forums this week in partnership with Manatee Educational Television. And Manatee County has a healthy plate of contested races to cover this election season. Editorial Page Editor Chris Wille leads each forum, and I join him on the panel to ask each candidate about their campaigns. A Bay News 9 representative also plans to join us in most of the debates. We started Tuesday afternoon with one forum for the four Supervisor of Elections candidates and one for the two Manatee sheriff candidates. Each provided more than a half-hour of informative insights. No big surprises yet, but stay tuned. We're gearing up for the two contested Manatee school board races on Friday, and four county commission forums next week. That's a lot of grilling. Manatee County has recorded another homicide this year, putting this area on a deadly track to break previous records. The slaying of Regina Nunez marks the 12th reported this year -- the grand total for all of 2011, as reported in this story by Herald reporter Richard Dymond. We already had plans to start an online database, but this foreboding volume brought this to the top of the list. 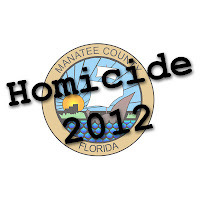 Web developer William Winter has launched this homicide interactive on Bradenton.com, starting with the first homicide on Jan. 1, 2012. He will continue to add dimensions, including statistics from past years. It already includes locator maps, the latest updates on each case, images from the crime scene, the victim and any suspects, and links to related stories. I'll admit upfront: Facebook is not my friend. So it takes a lot to grab my attention enough to want to blog about it. Thanks goes to Web Developer William Winter. He has created Bradenton Herald Facebook Covers for you to use on your own Facebook page. You can download these images by right-clicking on the picture you like, then selecting "Save Picture As..." or "Save Image As..." and saving it to your desktop. And Facebook has these instructions to help you from there. Let us know if you see one of our photographers' images you'd like us to consider adding, too. We have bragging rights to this slice of heaven. How to convince your publisher that the newsroom is making good use of the smart phones he's paying for? 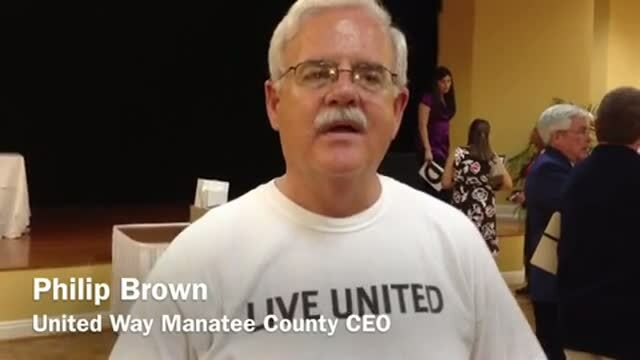 The reporter/columnist shows off in front of him at a United Way annual luncheon awards ceremony, using his smart phone to shoot video as the new CEO of United Way-Manatee gives his first official welcome speech. And the new CEO of United Way starts a striptease right in the middle of his speech. Got it. Posted. All for a good cause, as columnist Vin Mannix wrote in his story today. CEO Philip Brown took off the first few layers to reveal his "Live United" T-shirt, and won over the crowd in the process. And Vin got a round of applause from Publisher Bob Turner for capturing the moment -- in a tweet, in audio, in his story and, drum roll please, THE VIDEO. 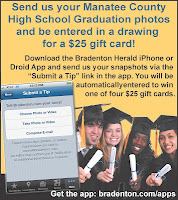 Calling all Manatee County high school graduates: We want your photographs, via the Bradenton Herald app. 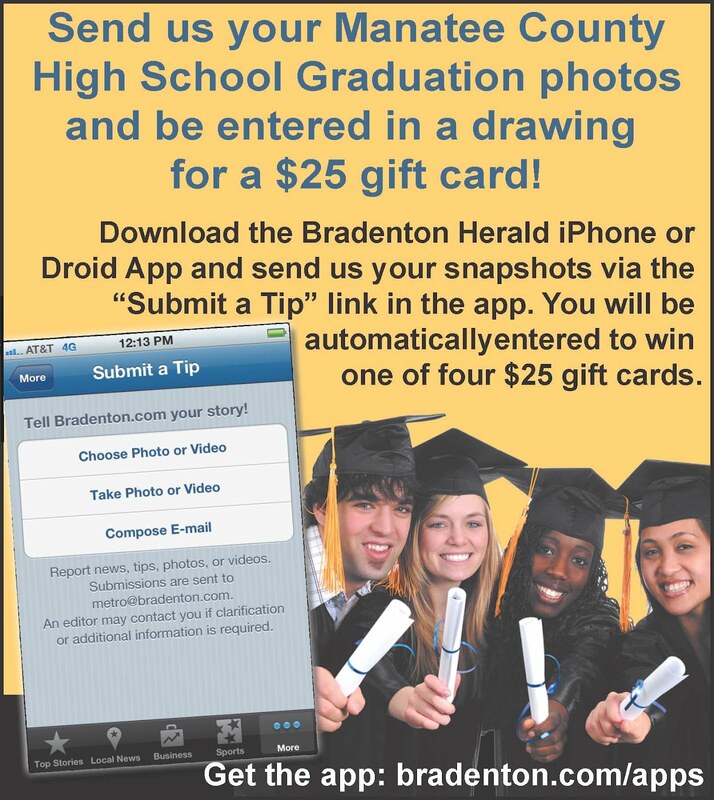 Then send us a photo from your graduation and you'll get a chance to win a $25 gift card. We'll also post the best photographs to our galleries at Bradenton.com/graduation/. That's where you'll find all our coverage of the next two weeks of graduation ceremonies throughout the area. You'll also find a link to our special Grads 2012 section, which appeared in the Bradenton Herald today thanks to Features Editor Jana Morreale's great production work. So hats off, grads. We'll be watching for you. Guess what new feature has been the most successful on Bradenton.com in the past two weeks? Well, if you know any high school juniors or seniors in Manatee County, you've checked it out: our Prom section, with photo galleries from all our schools' proms this year. Another McClatchy editor mentioned to me that their prom galleries generated fabulous "traffic" to their site. So Jennifer Rich, education editor among many other hats, scrambled to track down the dates in Manatee County and made the calls. Web developer William Winter created the section, and we were off. How successful? Tens of thousands of page views, and new visitors have also jumped. The latest addition was Bayshore High's prom gallery over the weekend, and it already has been viewed almost 20,000 times! The most popular to date: Palmetto High's prom gallery. Have some of your own photos to submit? Send them our way! You can submit through VMix, or email education reporter Christine Hawes. Golden Herald sponsors, please take a bow! 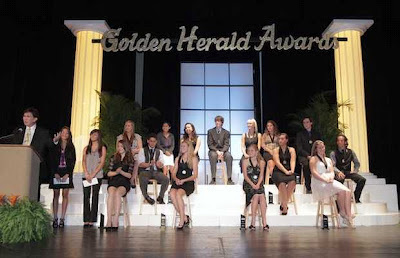 The 2012 Golden Heralds Awards were spectacular last night -- a blessed event, one that always humbles me as we recognize the amazing talents, dedication and determination of our top high school seniors. Each nominee crossing the Bradenton auditorium stage walked with pride and purpose. All of the top winners in each category had "Wow!" written across their faces as they beamed during the finalé. The event is 110 percent about the students and their accomplishments. But so much goes on behind the scenes for this moment each year. Leading the way for the Bradenton Herald is Jill McGarry, our marketing director extraordinaire. She pulls together everything: the judges, volunteers, program plans, speeches, name checks of all 148 nominees, instructors and, most importantly, the sponsors. Manatee Memorial Hospital: for years, a Platinum Sponsor of the Golden Heralds. Hospital Vice President Vernon DeSear has been the event's venerable emcee year after year. CEO Kevin DiLallo, along with Bay News 9 reporter Summer Smith, gave rousing testimony for each Golden Herald Award winner. Bright House Networks: Leah Brown was there to humbly acknowledge Bright House's commitment to the Golden Heralds. University of South Florida/Sarasota-Manatee and Keiser University. Jane Rose and Violeta Huesman joined me in introducing each student nominee, always a thrill. Regions Bank: Kimberly Hopper joined Leah in awarding the Honorable Mention winners. For now, please enjoy some of photographer Paul Videla's dozens of photos, as he captured so many moments enjoyed by the students last night. Across Manatee County today, events were held to recognize the 61st annual National Day of Prayer. 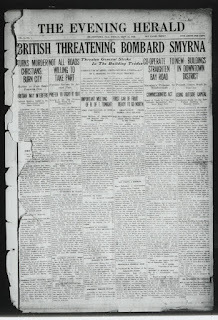 As reporter Nick Williams summed up in this early report, the nation has celebrated National Day of Prayer, a call to find humility and encourage one another to pray for the nation, since the observance was enacted by Congress and signed by President Harry Truman in 1952.
seven community leaders led the crowd in prayers, with the theme "One Nation Under God." Each prayer leader focused on one of the "Seven Centers of Power": government, military, business, church, family, education and the media. I was honored to be asked to lead the prayer for the media -- an assignment that sent me searching for wiser prayer leaders. My resources included my uncle, the Rev. A.C. Settlage in Chicago (soon moving to Bradenton! ); the St. Bride's Church in London and its journalists' altar; and my own heart. As a journalist and person of faith, this had to be "from the heart," as photojournalist Grant Jefferies reminded me just before we started. So we prayed for courage, inspiration, wisdom, guidance, justice and peace. Most of all, we prayed for love and truth. 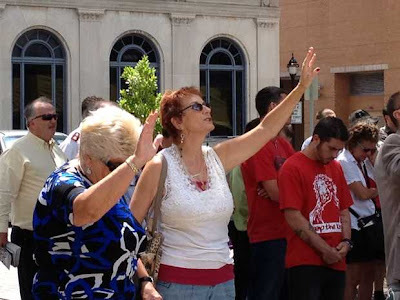 People gathered at the courthouse to pray/gjefferies@bradenton.com. A link to Grant's gallery. 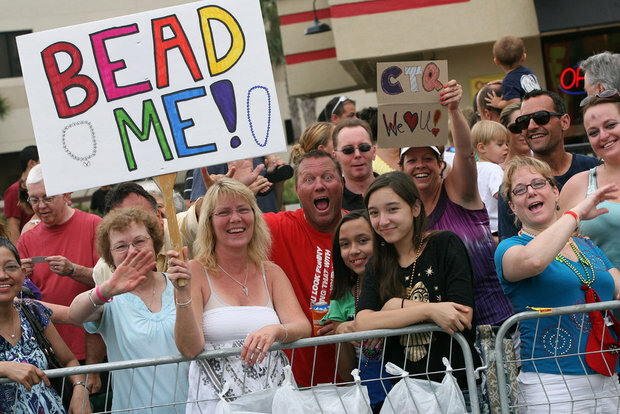 Congratulations to the Bradenton Herald/Bradenton.com staff for the best day ever for online traffic! On Monday, Bradenton.com recorded the highest single-day total page views in the site's documented history. What led the way? 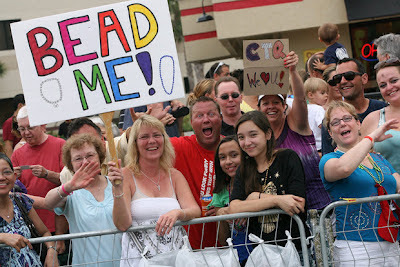 Tiffany Tompkins-Condie's two fabulous photo galleries: the DeSoto Parade and the Spotlight on Manatee's Jail Farm. We also had a lot of breaking news yesterday that drew a lot of viewers, including another slaying in the wee hours. But the two galleries trumped everything else. Each contains almost 50 photos, both of which took hours. The parade gallery was on deadline (which addresses a couple complaining comments on some repeated cutlines), and the farm gallery was a shared project with reporter Laura Morel for our ongoing examination of the jail's operation. The favorite photo seems to be one of those we chose for the 1A print centerpiece Monday morning. Not a bad way to start the week! Metro/Online Editor Marc Masferrer has started informative, motivating and somewhat competitive online updates throughout the day for the Herald newsroom. 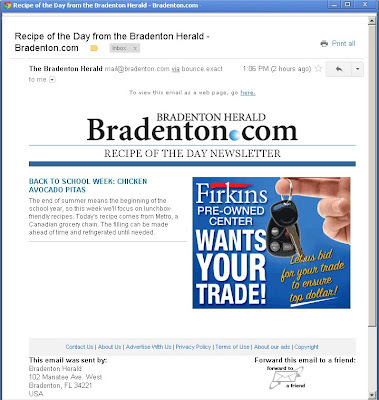 He starts the day sharing which galleries and stories have been viewed the most on Bradenton.com from the past 24 hours. And he then sends updates just before noon, mid-afternoon and then closing out the day. It's a great tool for reporters and photographers to see how their stories and galleries are doing online, and to check for updates or additional assets. Marc sends out the Top 10 overall, and the Top 10 galleries with one caveat: He excludes the criminal mugshot galleries, because they ALWAYS are among the most-viewed (sigh).